Five years after its formation and demise, Occupy is mostly a study in what to avoid for the anti-Trump movement. Five years ago, in the dead of night, New York City police swept through Zuccotti Park, the hub of Occupy Wall Street. Armed with riot gear, tear gas, and batons, they tore through tents and forcibly removed occupiers in the hopes of quelling a movement that had spread to nearly one thousand cities in eighty-two countries. 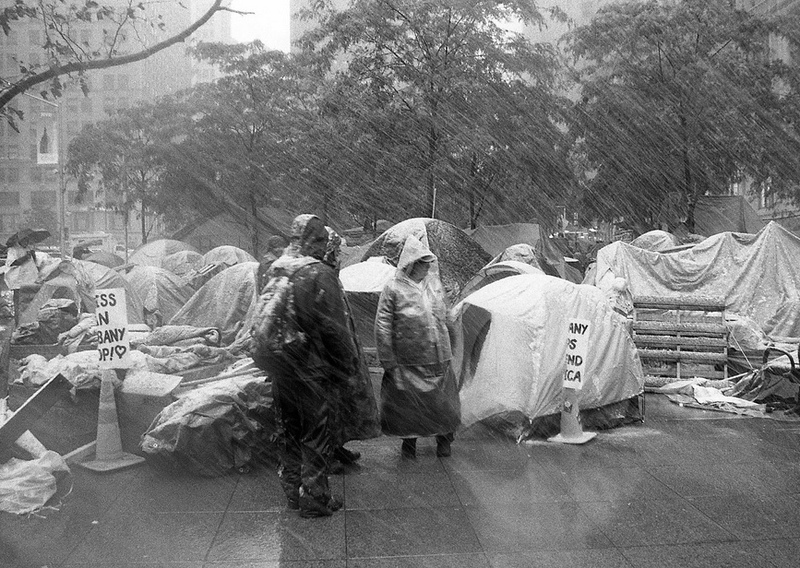 Today, Zuccotti Park has been fully restored to its original state: an austere corporate plaza in Lower Manhattan. But while Occupy’s drum circles and massive general assemblies have disappeared, the national conversation about inequality it sparked has not. When the five-year anniversary of the initial encampment passed this September, reporters, participants, and others praised Occupy for building a political consciousness that fueled Occupy Sandy, Black Lives Matter, Fight for 15, and the anti–Keystone Pipeline protests, among others. As Sean Illing wrote for Salon, “Occupy Wall Street didn’t so much fail as fracture into various groups and causes.” These offshoots, he argued, might directly challenge corporate power in a way the original movement never could. Others correctly noted that Occupy wasn’t a traditional political movement that made demands upon the state. It instead turned inward, believing the consensual and nonhierarchical community it was building in Zuccotti constituted a demand in itself. Sympathizers touted the camp as the instantiation of a new social awareness, a new way of relating to one another. “[W]e are literally laying the framework for a new world by building it here and now — and it works,” the New York City encampment proclaimed. Today, as high school students walk out en masse and anti-Trump protests sweep the country, the memory of Occupy should give us pause. Instead of creating a political movement that materially attacked the institutions of the 1 percent, many occupiers vowed to transform themselves and raise awareness at the individual level. Some responses to Trumpism have fallen into the same trap — treating the election of a far-right demagogue as an opportunity for soul-searching or a reason to rail against individual Trump voters. But just as tending urban gardens didn’t fundamentally challenge the prerogatives of capital, safety pins won’t bring down the reactionary figures taking the reins of government. To stop Trump, we’ll have to reject some of Occupy’s central precepts. Occupy’s emphasis on the individual sprang from its horizontalist antecedents — particularly the May 1968 occupations in France. Kalle Lasn and Micah White, who launched Occupy with their famous Adbusters meme, explicitly cited the leaderless, anti-hierarchical student demonstrations in Paris as their inspiration. Yet it’s telling that the sixties critique of uniformity and authority was appropriated not only by subsequent social movements, but by capitalism. Calls “to live, to express oneself, to be free” now survive as tag lines for soft-drinks and SUVS. In their book The New Spirit of Capitalism, Luc Boltanski and Eve Chiapello go so far as to argue that capitalism co-opted the ’68 demands for autonomy to create our contemporary postindustrial economy of worker instability and commanded flexibility. The ease with which the sixties ethos of autonomy was co-opted by capital didn’t seem to trouble Lasn and White, however. They saw the rise of autonomous politics as a source of potential rather than a sign of a weakened and splintered left. But the one-plank platform never materialized. As the protest expanded to include thousands of occupiers in hundreds of cities, the mainstream media increasingly pressed Occupy to lay out a set of policy desires. The fast-approaching winter months exacerbated these pressures, as camps across the country scrambled to figure out how to sustain an outdoor occupation in the cold. Occupy’s system of consensus-based decision-making turned this into a tiring and time-consuming, if not effectively impossible, task. Inspired by Spain’s acampadas, the occupiers opened general assemblies to everyone. If someone vehemently disagreed with a proposal, they could block it, and it would have to be adapted until a super-majority of ninety percent supported the proposal. It did not matter if the dissenter was new to a movement others had been invested in for weeks; they had just as much of a say as the original Occupiers. As a result, a simple decision like how to take care of laundry could take hours to make. The care we take in a consensus process to hear everyone’s opinions and weave them into a whole is a living demonstration that each one of us is important. It’s a counter to systems that tell us some people count while others don’t. In consensus, everyone matters. Consensus-based decision-making, then, was understood as a way to include marginalized voices in a movement that claimed to represent the 99 percent. But Occupy fostered inclusivity through individualism rather than organized collective action. In countless interviews about the movement, participants cautioned, “I can only speak for myself.” The ubiquitous caveat frustrated attempts to understand Occupy as a whole and to advance a collective project. Discussion became confined to personal experiences and opinions. Instead of a rallying point of unison, “We are the 99%” became a Twitter hashtag for the individual to express his personal struggles. In casting individual experiences as fundamentally unknowable to others, occupiers ignored the feminist insistence that the “personal is political.” The second-wave slogan emerged as a reaction to the capitalist credo of personal responsibility, pointing to the ways in which individual experiences were not merely private but in fact defined and shaped by political and social institutions. Distinct, yes — but still fundamentally collective. As Occupy gradually took shape, it moved in the opposite direction, loading the burden on the individual. Too often, the political was nothing but the personal. Too frequently, occupiers focused on “kill[ing] the one-percenter within” instead of pressuring the state to rein in the 1 percent. All of this was fine with Adbusters. As White’s latest book makes clear, the anti-consumerist, culture-jamming magazine still regards resistance as a matter of changing one’s thought patterns and lifestyle choices. While it’s easy to laugh at his claim that “climate change is happening because of the state of our minds,” this sort of magical thinking survives in the recent outpouring of praise for Occupy as consciousness-raising. It also lives on in the call to check one’s privilege, which often imagines that self-edification — rather than structural change — can solve inequality. But realizing one’s individual privilege does nothing to dismantle the prison industrial complex, or block environmentally destructive legislation, or improve wages for workers. Ideology is not a set of attitudes that people can “have” as they have a cold, and throw off the same way. Human beings live in human societies by negotiating a certain social terrain, whose map they keep alive in their minds by the collective, ritual repetition of the activities they must carry out in order to negotiate the terrain. If the terrain changes, so must their activities, and therefore so must the map. Fields’ definition of ideology puts the power of personal autonomy in its place. Rather than a “law unto itself,” the individual is situated in the prevailing system of authority. Before the individual can be changed, the system must be restructured. Both Fields’ conception of ideology and the shortcomings of Occupy are worth keeping in mind as we mobilize against Trump and his racism, sexism, and Islamophobia. An effective opposition movement cannot be about privilege checking or soul searching. It must challenge the structures and forces that brought Trump to power. Campus safe spaces won’t do this. Neither will safety pins. Instead we must stand against the disastrous effects of deregulation, privatization, and a disintegrating social safety net. We must organize collectively against an economic system that uses racism, xenophobia, and misogyny to pit worker against worker. Taking on an entire economic and political system sounds daunting. Especially in the face of a rising far right, smaller victories — like moral denunciations and attitudinal shifts — may seem like our only option. But the years since Occupy have witnessed a renewed emphasis on organized mass action, whether in the form of labor and racial justice struggles or party politics. The Fight for 15 movement, Black Lives Matter, the Jeremy Corbyn upsurge — each rebuts the idea that the individual is the agent of change. And for all its emphasis on the individual, Occupy also reintroduced class politics into the public discourse and helped set the stage for Bernie Sanders’s insurgent run. With an impending Trump presidency, the need for radical political action — rather than just individual acts — has become even more urgent. We have no choice but to organize on a mass scale against the new political and economic reality.